If you’re interested to see if you have the latest firmware installed on your Samsung Galaxy Note 2, then you’re in the right place. People are always asking about the latest updates, and that’s because people get bored with their devices. Android updates usually come with new features and new things that you can do with your device. It is also important to keep your Samsung Galaxy Note 2 updated to the latest firmware because of security vulnerabilities. Android is a pretty secure operating system, but the threats are starting to become more numerous and more serious and having the latest firmware means you are protected from these threats. It is the same way Microsoft updates Windows regularly to secure new vulnerabilities. 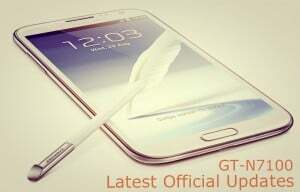 How to update your Galaxy Note 2 to the latest firmware? Normally, updates for Note 2 appear on the screen as OTA updates. So when a new update is released, you will be prompted with a message saying that there’s a new update available. You need a fast internet connection to update this way. To check for new updates, go to Settings>General>About Device>System Updates. If there is a new OTA available it should appear here. Samsung Kies is the official Samsung program that allows you to update your device and do all sorts of things. Basically, you need to install Kies on your PC, connect the device and check for the latest updates. Here is a tutorial if you are having trouble using Kies. I do not recommend this one, but if you are an experienced user you can download the firmware and install it manually. You can use this method if an upgraded Android version was released for your device (i.e from Android 4.1.2 to Android 4.3) and the update has not reached your country yet and you don’t have the patience to wait. You can use this tutorial for more info. First of all, you will have to check out what’s your current firmware. You have to check the so called Build Number. Go to Settings>General>About Device>Build Number. It should contain something like this: “N7100XXDMC3”. Now, find your country in the list below and see if the build number matches the one on your device. The final 4 characters from the build number (i.e DMC3) are the PDA. You should look for this when you check your device’s firmware. If you don’t see a match, then use one of the methods mentioned above and check for updates. If you can’t find any using Kies or OTA, then make sure your Galaxy Note 2 is version N7100 (this is the one without 4G LTE) and that it is not carrier blocked.